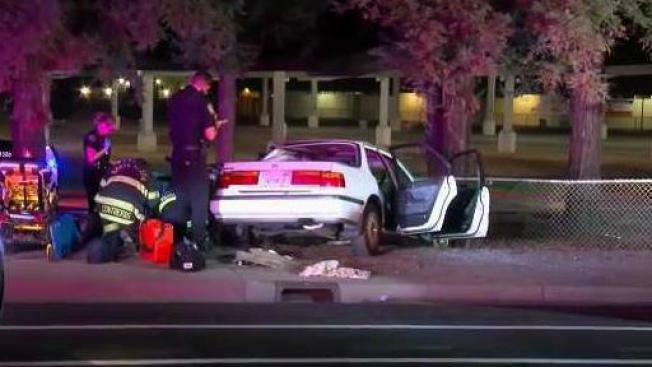 Two juveniles were arrested in Santa Clara early Sunday morning after leading authorities on a chase in a stolen car, according to police. The pursuit started at roughly 3:30 a.m. near Gold and Lafayette streets, according to police. Officers spotted the previously reported stolen Honda Accord and attempted to make the driver stop, but he did not pull over. The driver of the Honda eventually lost control in the area of Scott Boulevard and Homestead Road, drove off the roadway, smashed through a fence and slammed into a tree, police said. Both the driver and a male passenger were arrested, according to police. The driver suffered a broken leg and was transported to the hospital. The passenger was booked into juvenile hall. The driver is charged with grand theft auto and evading police, police stated. The passenger is charged with possession of stolen property.